It says to stop looking for her. Someone created a fake Facebook page that claims missing college student Mollie Tibbetts purposely ran away. 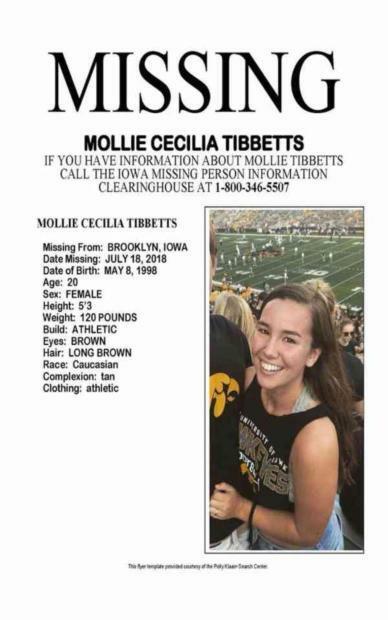 Mollie, 20, vanished without a trace in Iowa on July 18, leaving family members, friends, and police puzzled and many questions unanswered. Babe.net uncovered a Facebook page under Mollie Tibbett's name that created late last month. She already had an account. The user behind the account is unknown and continues to post that Mollie left everything behind to be with a mystery man. Most of the posts on the page seem to be made by the man she allegedly ran away with and not by Mollie. "Mollie wants to be here," a post from Aug. 1 reads. "I don’t know why everyone wants to take her away from me. I’ve waited so long for this. No one is going to ruin this for us." Some of the posts go into more detail, explaining that Mollie is unable to use her former profile so she made a second one. "There are 2 reasons I created this page," a post from July 28 reads. "I wanted friends, my boyfriend and family to know I am ok."
"The other reason is because I am no longer able to gain access to my Facebook profile to communicate with anyone. My guess is that investigators have taken it over in an effort to find me. I just want to be left alone right now. Thank you." Police have theorized that Mollie knows whoever she is with, whether she was taken or went willingly. Mollie's' boyfriend, Dalton Jack, is not convinced she ran off on her own accord. "This is not like her," Jack said last week. "If this is her running off, nobody would've seen it coming. Nobody in the world. Not her family, not me -- nobody would've ever guessed that she just take off and not tell anybody." O'Toole feels the same way. Mollie's father, Rob Tibbetts, said he thinks someone she is familiar with took things too far. Rob pleaded with the person who has Mollie to let her come home before things escalate any further. "Let Mollie come home and hold yourself accountable for what you've done so far, but don't escalate this to a point where you can't recover yourself," he said. Jack is desperate for his girlfriend to return home safely, making it seem unlikely that she would have left him for an unknown man. "Everybody has a Mollie, a person that has changed your life in such a huge way and that’s in everybody’s lives," he told ABC News' Cecelia Vega. "Just imagine if somebody had taken your Mollie. Put yourself in our shoes. You would do anything to get her back and you would just be desperate for anything to come forward to get her back."